To enable HTTPS on your website, you need to get a certificate (a type of file) from a public Certificate Authority (CA). Let’s Encrypt is such a CA, which offers free trusted certificates. There are several clients around to retrieve a certificate from Let’s Encrypt. But none of them offer a consistent way to automate the process, when using Domino as your HTTP-Server. Either the client tool is only available for Linux, or you have to install additional Perl/Python interpreter on your Domino server machine to run scripts. And then there is the Domino properitary keystore format. midpoints Let's Encrypt for Domino closes this gap. We at midpoints were looking for a solution to get Let’s Encrypt certificates working together with Domino as close and automated as possible. So we started the midpoints Let’s Encrypt 4 Domino project for internal use. Provides all parts of the certificate creation / renewal process in a single Domino application. LE4D will support Alternative Subject Names as Let's Encrypt does, which will allow you to put multiple domain / subdomains into one cert. midpoints LE4D let you fully automate the process, including renewal of certificates in the key ring file and HTTP task restart. - Open the LE4D database and create a new setting document. 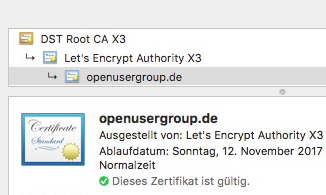 That's it: You have got your first Let's Encrypt certificate, which is already in a Domino Key Ring (KYR) file ready to use. At this place we would like to thank our midpoints employees Ulrich Krause aka eknori and Detlev Poettgen aka netzgoetter for digging into the Let's Encrypt API to make LE4D possible. How can I get a free copy of midpoints Let's Encrypt 4 Domino or submit a support / feature request? It's simple, just fill out the form to get your copy of Let's Encrypt 4 Domino or to get in touch. After we received your request, we will send you the installation package by mail within the next 24 hours. I have read the Notes on Data Protection and agree to the terms! Due to it’s Java compliance, it needs a Java 8 Runtime (Included since 9.0.1 FP8). If you are running into issues using midpoints LE4D just drop us an email or fill out the contact form. The midpoints team would be glad to help you to get it running. For companies running LE4D we offer extended support, just ask for a quote. You can use midpoints LE4D for free as it is. If you are missing a feature or will need more or deeper integration, we can extend LE4D for your need.